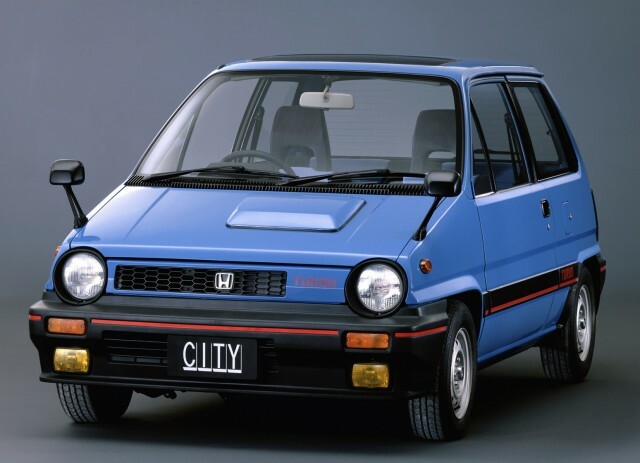 ￼As long-time Honda enthusiasts, it is hard nowadays not to marvel at the many creative and awesome machines that bore the iconic “H” during the 1980s. One of our favorites from those days is the Honda City. An unassuming econobox it may seem, but the little Honda is actually chock full of charisma and historical significance. Over the last few years, there’s been increasing recognition and appreciation for this car in the US, so perhaps the time is ripe for another article about this bona fide JNC. Development of the City began in 1978, when many automakers were still struggling with fuel efficiency. Honda, a relatively young car company, was not content to rest on laurels built upon the successful Civic and Accord. The impending second-generation Civic was growing in size, and development of a smaller car that slotted below it was initiated. 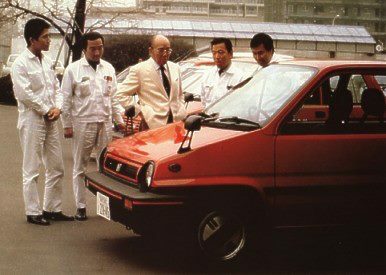 To achieve a car of subcompact size and efficiency yet with a livable amount of cabin room, the team settled on a space-maximizing upright stance that they dubbed “tall boy design.” The resultant car debuted in 1981, powered originally by the ER 1.2-liter inline-4. 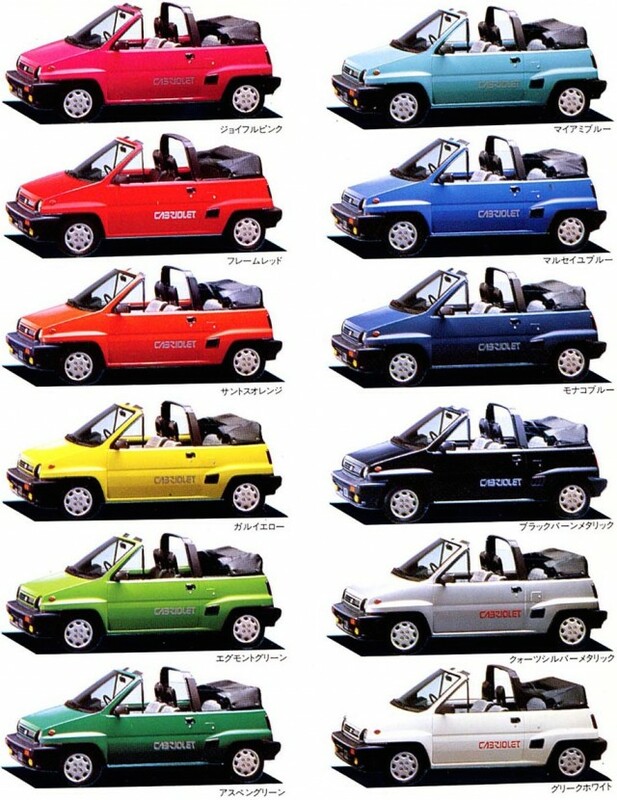 Let’s be clear: It was not a kei car (Honda’s passenger kei car, the Today, would follow in 1985, looking like a junior City), but the clever packaging could comfortably seat four passengers and achieved excellent fuel economy. It was a runaway success. There’s no mistaking it for anything other than an economy car though, a design that’s tidy albeit funky. Especially notable are the trapezoidal wheel wells, buttressed fender-mounted mirrors, and slight spoiler-like kick above the rear hatch. Perhaps you can chalk this love up to a peculiar aesthetic sense. Consider, then, this unique feature of the City: the Motocompo. 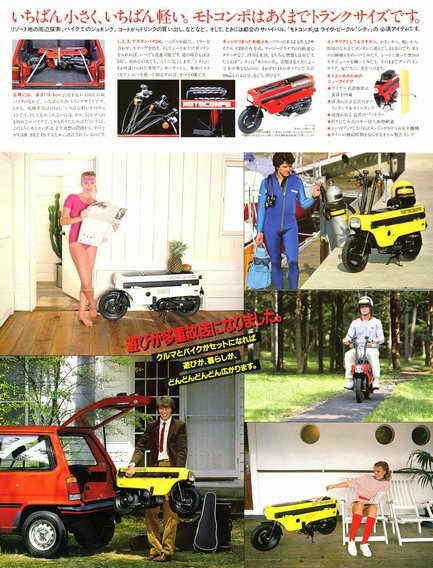 The Motocompo is one of the oddest and coolest vehicles Honda ever devised. A 50cc folding scooter available in the bright primary colors of red, blue, or yellow, it was designed ￼￼￼from the beginning to go with the City. 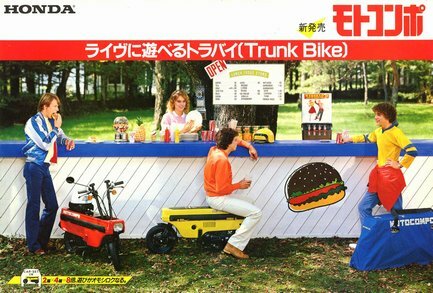 Specifically, the City’s trunk was designed to be just large enough to carry the Motocompo. A car with its own onboard motorcycle? This made the City+Motocompo some kind of fantasy-gadget-car-come-true, the perfect urban transport duo. Sales success and Motocompo aside, the City had something else that makes it a small legend. And there’s a Mugen connection in there. Mugen, Honda’s famous tuning and racing partner, was founded in 1973 by Hirotoshi Honda and Masao Kimura. Hirotoshi, son of Soichiro Honda, had been building race cars since he was in college. By the time the City hit market, Mugen had had some success tuning engines but it was not yet well-known. 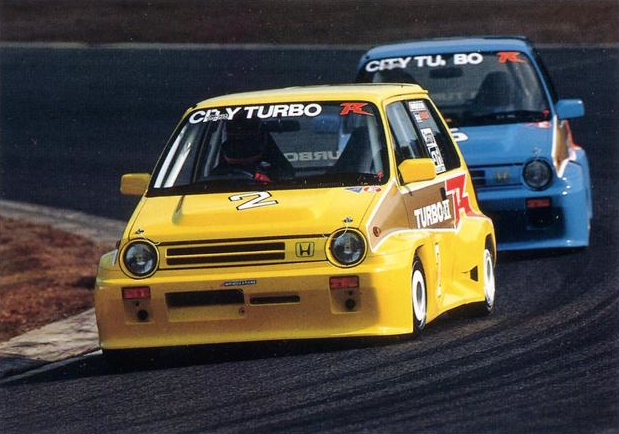 Perhaps to demonstrate Mugen’s ability to tune whole cars, Hirotoshi did to the City what John Cooper did to the Mini: turning a cheap and efficient city car into a little hot rod, via turbocharging in this case. 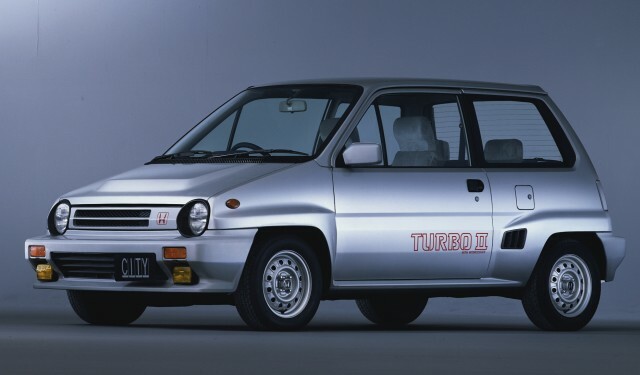 The result impressed Honda so much that it was developed into a production model as the City Turbo. 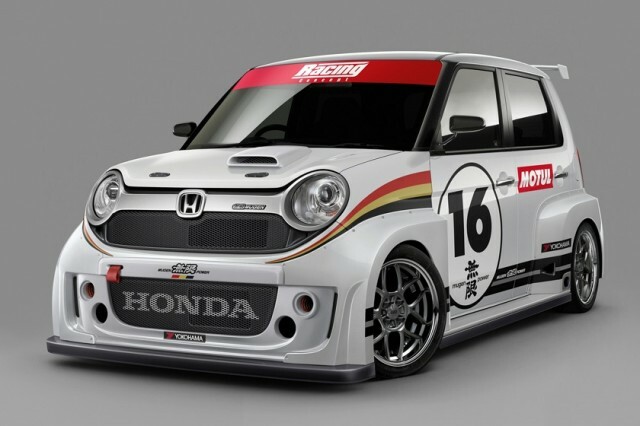 Turbocharging has traditionally not been preferred by Honda, but in this case the inspiration came from Mugen. 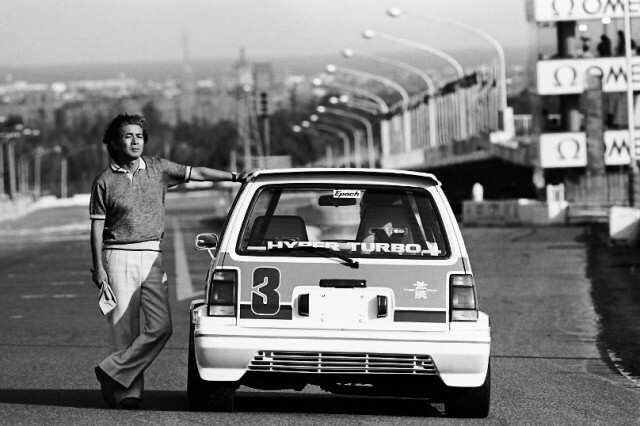 The production Turbo was released in September of 1982, with an IHI turbocharger on the CVCC ER engine. Notably, it was the first automotive application of PGM-FI, Honda’s electronic fuel injection system. Output was 100PS, put to asphalt via a 5-speed manual transmission. For a car weighing about 1500 pounds, this was a pretty good power-to-weight ratio at the time. Chassis changes comprised of upgraded springs, front and rear stabilizers, and front disc brakes — from the Prelude! It was a thorough and sophisticated makeover. Speaking of sophistication, big “Hyper Turbo” decals on the rear window let other city cars know what overtook them, while on the inside the driver faced an ‘80s-tastic digital instrumental panel. The following October, the Turbo II model joined the lineup with an intercooler and a 10PS bump. The Turbo II was famously known as the “Bulldog,” a nod to its blistered fenders, wider track, and hunkered-down stance. Period commercials of the Bulldog even featured a stop-motion robotic bulldog. 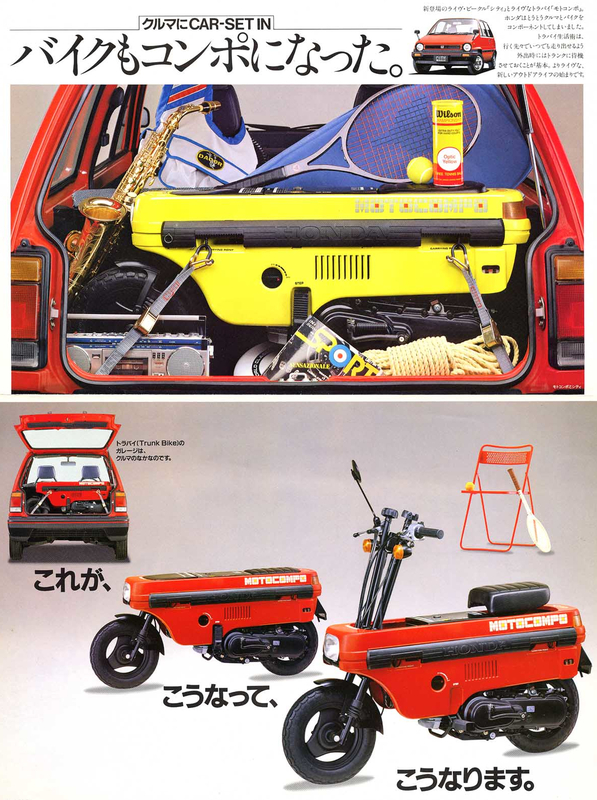 Both Turbo models can, of course, accommodate the Motocompo. 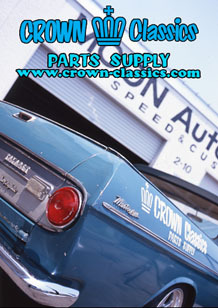 Popularity of the City extended outside the automotive world as well. 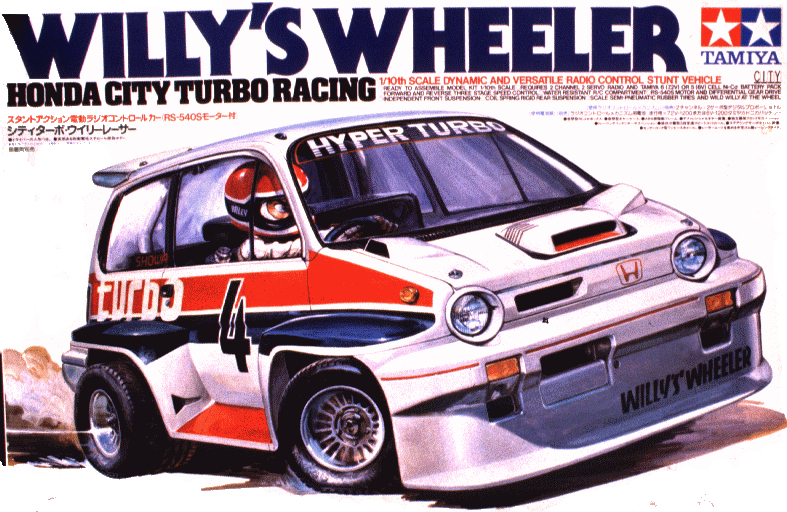 Tamiya produced no fewer than four 1:24 scale Honda City models as well as a 1:10 scale radio controlled model called Willy’s Wheeler based on the Turbo R. Aoshima also produced a 1:24 scale model of the Turbo II R. There was even a Transformer based on the City Turbo, Skids, and it came with a Motocompo. 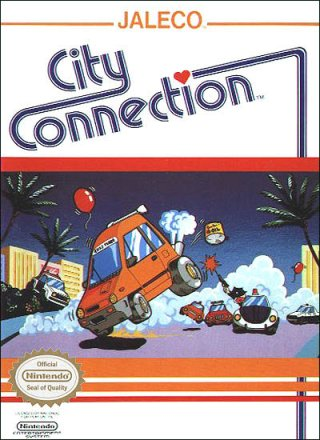 ￼￼The City was also featured in a Nintendo game, made by Jaleco, called City Connection. 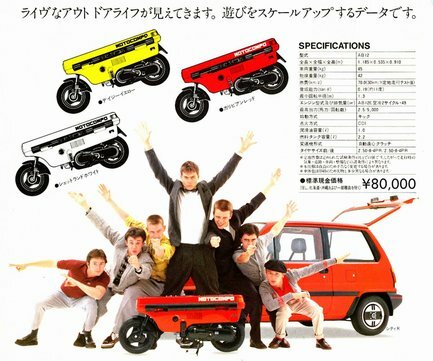 More recently, the City renaissance has seen ABC Hobby add the Turbo II to its lineup of 1:10 scale bodies for R/C cars, while AUTOart produces a 1:18 scale diecast of the Turbo II, complete with Motocompo, and even the robotic bulldog from the commercial. 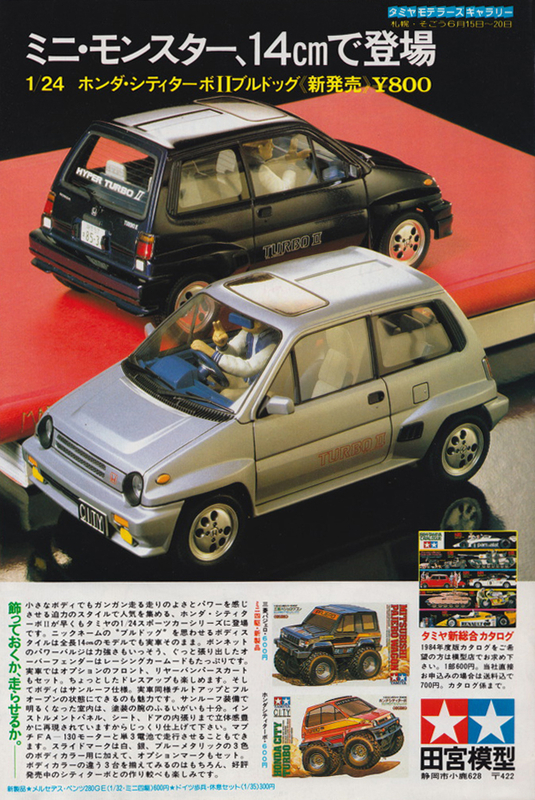 Ebbro also has a nice selection of 1:43 scale Turbo Rs. This ugly duckling sure has its fans! The first generation City stayed in production until 1986, when it was replaced by the second generation. The new car was sleeker and did away with the “tall boy design.” The Turbo did not return, nor did the Cabriolet. This generation lingered until 1993, after which the City disappeared from the Japanese lineup. Nowadays, the City is the name for an uninspiring sedan version of the Honda Fit sold in south Asia and South America. It seemed there was not much love for the 80s classic, but at the 2013 Tokyo Auto Salon, however, Mugen showed the N-One Racing Concept, which bore remarkable resemblance to the Turbo II R. It was a nice valentine to the City Turbo from those responsible for its inception, and we’re glad somebody there still remembers. tagged: city, Hirotoshi Honda, honda, motocompo, mugen, n-one. 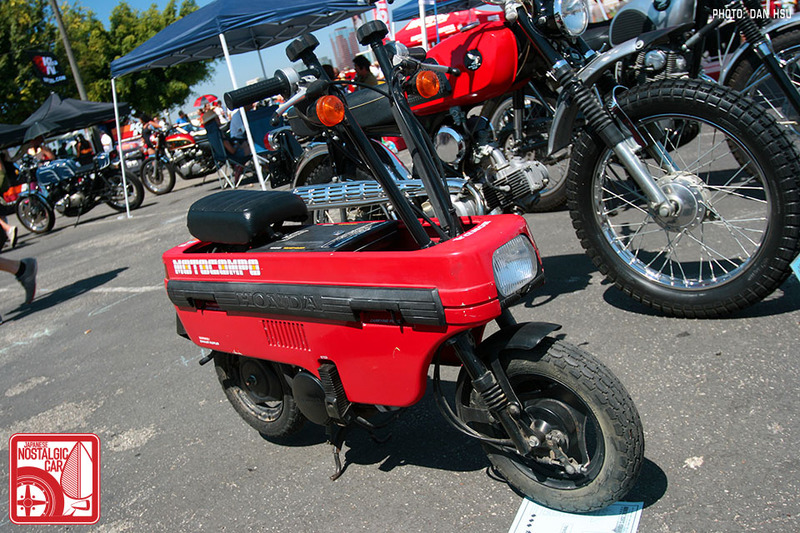 I always loved the Motocompo concept. The thing is, I couldn’t understand why it never caught on. I thought about trying to buy one for the trunk of my own small car (Geo Metro) but found the prices to be above my budget. So, I then thought about building my own. This led me to the one thing I think kept the original from catching on in the first place (besides the absurdity of it to most consumers), and that one thing is weight. A Motocompo weighs around 100lbs (45 kilos) and I just can’t imagine it was too easy to get in and out of the back of a City. I still want one, but wish I had the tools and skills to build one using modern materials to shave some weight. I think it would be possible to cut as much as 25lbs off the original by using an aluminum frame and some carbon fiber components. That’s a very good point. Lugging it in and out of the trunk may have been cumbersome. A couple years ago I saw one on eBay brand new still boxed up (in the requisite Japanese packaging, with the Motocompo graphic all over the box). It wasn’t cheap, but it’s somewhat of a cult product by now. Honda did recently show a “Motor Compo,” Motocompo reimagined as a folding electric scooter. Might we be so lucky? We might, but it will depend on the tradeoffs. With electric power, you need heavy magnets to make the motor efficient, and heavy batteries to give it range. I would think a 25 mile range would be sufficient, and a top speed of 25-35mph with an average rider weight of 200 lbs. The problem is, how do you package that in a form factor and weight that most people would be willing to live with? 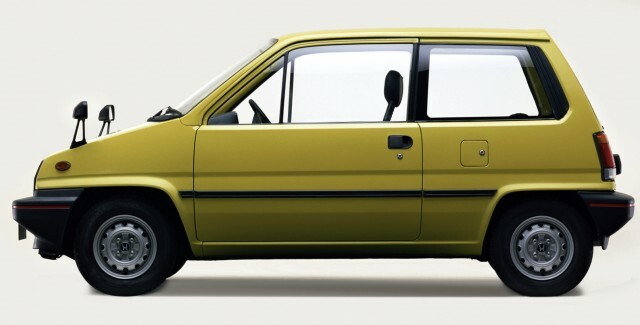 I think the sweet spot for vehicle weight is probably around 35-40lbs, and it should be able to fit in a Fit’s cargo area without taking up all of the cargo space (preferably this would put it off to one side rather than in the middle, in order to take advantage of the folding seats). I would also add a kit that allows in vehicle charging from a choice of either the car’s main electrical system or a set of rooftop solar panels. This could be tailored to be both a generic system for non-Honda vehicles and a vehicle-specific system for Honda’s smaller models. I also think it needs to have a cargo basket as part of the system since most people rarely carry just themselves. Convenience, ease of operation and the right price point are essential to the success of a product like this, which brings me to my criticism of the original. The problems I see are that the handlebars are not easily deployed, and the cover for when it is not in use required you to leave it behind. The handlebars could have been much easier to deploy than the long screw arrangement that Honda used. Also, the bike could have had a better folding arrangement for tucking the wheels in tighter, thus making for a shorter stored package that would have also fit within the confines of competitor’s vehicles and increased sales. Lastly, the cover should have retracted within the vehicle so that it was easier to keep track of it and reduce the risk of breakage. Yep, I’ve wanted a Turbo II since I was a kid. (I do have the Tamiya 1/24 version). I remember reading about this car and was waiting for its to arrival in the USA, which unfortunately never happened. It’s too bad because it would have been a success. I suppose Honda did not want the City to take up sales from the Civic and Accord, which were gaining popularity in the 80’s. I have a nice 1/18 scale model of the Honda City, in addition to 1/24 scale models of the hardtop and convertible. I wanna play that NES Game! I’ve got a copy. It’s a sidescrolling game with three vertical levels, in which you try to light up all the floor tiles and jump over police and pedestrians. Sounds more fun than it really is though. We have a 1984 Turbo I, with a Motocompo. Either one is a blast on its own. When it’s not on display, I use the ‘Compo to run errands around the museum. And I bet I’m probably in the minority on this, but I prefer the Turbo I body to the Bulldog Turbo II.